SOME NOTES ON THE DOE LEA LINE (Glynn Waite). 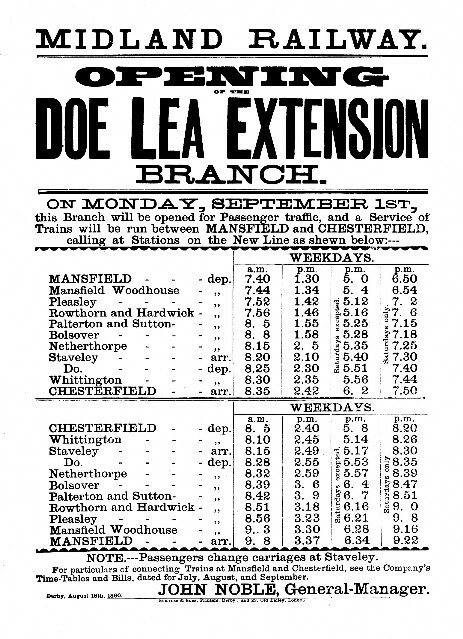 The Doe Lea Branch was opened to mineral traffic in August 1866 and to goods on 10th November 1884, when the line was extended to Glapwell Colliery (more later). 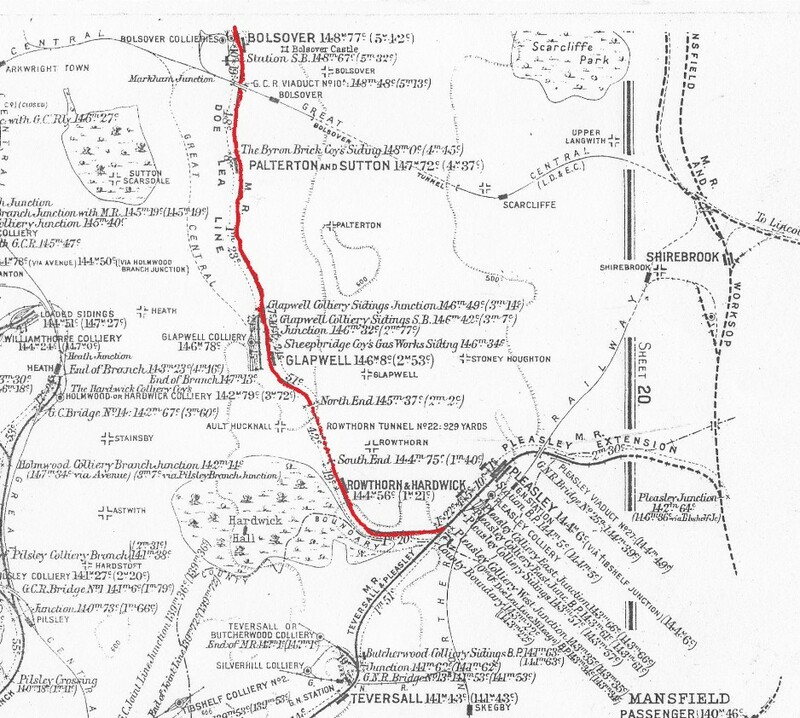 The original terminus of the Doe Lea Branch is shown as 1m 28ch from Seymour Junction, which would have been part way between the latter-day Markham Colliery Sidings and Bolsover (see extract from distance diagram, with lines of other companies removed and gradient profile, which also refers to the three “Doe Lea sections”). I cannot say where Glapwell 1st station was situated, but note that Gough shows that this dealt with goods traffic only and has a query against the date (10th November 1884). My gut feeling is that it was adjacent to the colliery and that it was initially used in connection with the movement of traffic to and from the colliery – which was still being developed at that time. Note that he also shows this as closing four weeks after the line was extended to Pleasley Colliery West Junction (29th September 1890), again with a question mark. This indicates that it was not really used by the general public. 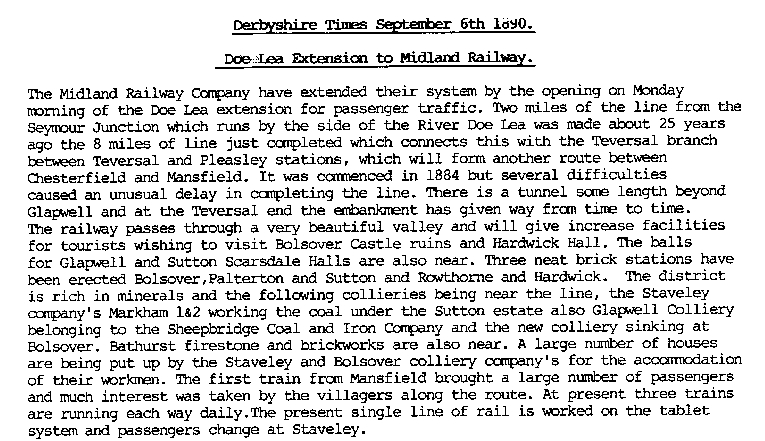 The next development was the introduction of workmen’s services from Staveley to Glapwell Colliery on 1st September 1886. I am not sure of the actual location at Glapwell, but it would appear that there was a platform within the colliery complex. Tickets were just shown as to Glapwell – i.e. without mention of the word Colliery. However, there was no real need to include this as there were no passenger services at this time – though it is perhaps surprising that when such services were introduced the original format, without the word Colliery, continued to be used. Not included in John Gough’s chronology, but gleaned from WTTs, is the introduction from 1st October 1888 of a daily mineral service in each direction which called at Bolsover and Sutton & Palterton (note opposite format from that used when passenger services introduced). A passenger station at Glapwell subsequently opened on 22nd August 1892. Gough shows that the opening was for passenger and mineral. The passenger station was a single platform on a single line. There were no sidings leading from the single line in the station area, so I can only assume that the mineral facility was located within the colliery complex, possibly as a land sales location. Only odd mineral / goods trains passed over the route from Glapwell Colliery Junction to Pleasley Colliery West Junction as the ruling gradient from Glapwell to just beyond the southern end of Rowthorn Tunnel was 1 in 50. Consequently, when passenger services were withdrawn on 28th July 1930, it was possible to close the line completely – albeit that a section at the Pleasley end was used for a short while for storing empty wagons. Article from the Derbyshire Times. A. Jackson. Poster copies sent to me by Glynn Waite & John Platts.